For information on semiconductor physics, see Semiconductor. A semiconductor device is an electronic component that exploits the electronic properties of semiconductor material, principally silicon, germanium, and gallium arsenide, as well as organic semiconductors. Semiconductor devices have replaced vacuum tubes in most applications. They use electrical conduction in the solid state rather that the gaseous state or thermionic emission in a vacuum. Semiconductor devices are manufactured both as single discrete devices and as integrated circuits (ICs), which consist of two or more devices—which can number in the billions—manufactured and interconnected on a single semiconductor wafer (also called a substrate). Semiconductor materials are useful because their behavior can be easily manipulated by the deliberate addition of impurities, known as doping. Semiconductor conductivity can be controlled by the introduction of an electric or magnetic field, by exposure to light or heat, or by the mechanical deformation of a doped monocrystalline silicon grid; thus, semiconductors can make excellent sensors. Current conduction in a semiconductor occurs due to mobile or "free" electrons and electron holes, collectively known as charge carriers. Doping a semiconductor with a small proportion of an atomic impurity, such as phosphorus or boron, greatly increases the number of free electrons or holes within the semiconductor. When a doped semiconductor contains excess holes, it is called a p-type semiconductor (p for positive electric charge); when it contains excess free electrons, it is called an n-type semiconductor (n for negative electric charge). A majority of mobile charge carriers have negative charge. The manufacture of semiconductors controls precisely the location and concentration of p- and n-type dopants. The connection of n-type and p-type semiconductors form a p–n junctions. A semiconductor diode is a device typically made from a single p–n junction. At the junction of a p-type and an n-type semiconductor there forms a depletion region where current conduction is inhibited by the lack of mobile charge carriers. When the device is forward biased (connected with the p-side at higher electric potential than the n-side), this depletion region is diminished, allowing for significant conduction, while only very small current can be achieved when the diode is reverse biased and thus the depletion region expanded. Exposing a semiconductor to light can generate electron–hole pairs, which increases the number of free carriers and thereby the conductivity. Diodes optimized to take advantage of this phenomenon are known as photodiodes. Compound semiconductor diodes can also be used to generate light, as in light-emitting diodes and laser diodes. Operation of a MOSFET and its Id-Vg curve. At first, when no gate voltage is applied. There is no inversion electron in the channel, the device is OFF. As gate voltage increase, inversion electron density in the channel increase, current increase, the device turns on. Bipolar junction transistors are formed from two p–n junctions, in either n–p–n or p–n–p configuration. The middle, or base, region between the junctions is typically very narrow. The other regions, and their associated terminals, are known as the emitter and the collector. A small current injected through the junction between the base and the emitter changes the properties of the base-collector junction so that it can conduct current even though it is reverse biased. This creates a much larger current between the collector and emitter, controlled by the base-emitter current. Another type of transistor, the field-effect transistor, operates on the principle that semiconductor conductivity can be increased or decreased by the presence of an electric field. An electric field can increase the number of free electrons and holes in a semiconductor, thereby changing its conductivity. The field may be applied by a reverse-biased p–n junction, forming a junction field-effect transistor (JFET) or by an electrode insulated from the bulk material by an oxide layer, forming a metal–oxide–semiconductor field-effect transistor (MOSFET). The MOSFET, a solid-state device, is the most used semiconductor device today. The gate electrode is charged to produce an electric field that controls the conductivity of a "channel" between two terminals, called the source and drain. Depending on the type of carrier in the channel, the device may be an n-channel (for electrons) or a p-channel (for holes) MOSFET. Although the MOSFET is named in part for its "metal" gate, in modern devices polysilicon is typically used instead. By far, silicon (Si) is the most widely used material in semiconductor devices. Its combination of low raw material cost, relatively simple processing, and a useful temperature range makes it currently the best compromise among the various competing materials. Silicon used in semiconductor device manufacturing is currently fabricated into boules that are large enough in diameter to allow the production of 300 mm (12 in.) wafers. The most common use for organic semiconductors is organic light-emitting diodes. The type designators of semiconductor devices are often manufacturer specific. Nevertheless, there have been attempts at creating standards for type codes, and a subset of devices follow those. For discrete devices, for example, there are three standards: JEDEC JESD370B in United States, Pro Electron in Europe and Japanese Industrial Standards (JIS) in Japan. Semiconductors had been used in the electronics field for some time before the invention of the transistor. Around the turn of the 20th century they were quite common as detectors in radios, used in a device called a "cat's whisker" developed by Jagadish Chandra Bose and others. These detectors were somewhat troublesome, however, requiring the operator to move a small tungsten filament (the whisker) around the surface of a galena (lead sulfide) or carborundum (silicon carbide) crystal until it suddenly started working. Then, over a period of a few hours or days, the cat's whisker would slowly stop working and the process would have to be repeated. At the time their operation was completely mysterious. After the introduction of the more reliable and amplified vacuum tube based radios, the cat's whisker systems quickly disappeared. The "cat's whisker" is a primitive example of a special type of diode still popular today, called a Schottky diode. Another early type of semiconductor device is the metal rectifier in which the semiconductor is copper oxide or selenium. Westinghouse Electric (1886) was a major manufacturer of these rectifiers. Ohl investigated why the cat's whisker functioned so well. He spent most of 1939 trying to grow more pure versions of the crystals. He soon found that with higher quality crystals their finicky behaviour went away, but so did their ability to operate as a radio detector. One day he found one of his purest crystals nevertheless worked well, and it had a clearly visible crack near the middle. However as he moved about the room trying to test it, the detector would mysteriously work, and then stop again. After some study he found that the behaviour was controlled by the light in the room – more light caused more conductance in the crystal. He invited several other people to see this crystal, and Walter Brattain immediately realized there was some sort of junction at the crack. Further research cleared up the remaining mystery. The crystal had cracked because either side contained very slightly different amounts of the impurities Ohl could not remove – about 0.2%. One side of the crystal had impurities that added extra electrons (the carriers of electric current) and made it a "conductor". The other had impurities that wanted to bind to these electrons, making it (what he called) an "insulator". Because the two parts of the crystal were in contact with each other, the electrons could be pushed out of the conductive side which had extra electrons (soon to be known as the emitter) and replaced by new ones being provided (from a battery, for instance) where they would flow into the insulating portion and be collected by the whisker filament (named the collector). However, when the voltage was reversed the electrons being pushed into the collector would quickly fill up the "holes" (the electron-needy impurities), and conduction would stop almost instantly. This junction of the two crystals (or parts of one crystal) created a solid-state diode, and the concept soon became known as semiconduction. The mechanism of action when the diode is off has to do with the separation of charge carriers around the junction. This is called a "depletion region". Armed with the knowledge of how these new diodes worked, a vigorous effort began to learn how to build them on demand. Teams at Purdue University, Bell Labs, MIT, and the University of Chicago all joined forces to build better crystals. Within a year germanium production had been perfected to the point where military-grade diodes were being used in most radar sets. The key to the development of the transistor was the further understanding of the process of the electron mobility in a semiconductor. It was realized that if there were some way to control the flow of the electrons from the emitter to the collector of this newly discovered diode, an amplifier could be built. For instance, if contacts are placed on both sides of a single type of crystal, current will not flow between them through the crystal. However if a third contact could then "inject" electrons or holes into the material, current would flow. Actually doing this appeared to be very difficult. If the crystal were of any reasonable size, the number of electrons (or holes) required to be injected would have to be very large, making it less than useful as an amplifier because it would require a large injection current to start with. That said, the whole idea of the crystal diode was that the crystal itself could provide the electrons over a very small distance, the depletion region. The key appeared to be to place the input and output contacts very close together on the surface of the crystal on either side of this region. Brattain started working on building such a device, and tantalizing hints of amplification continued to appear as the team worked on the problem. Sometimes the system would work but then stop working unexpectedly. In one instance a non-working system started working when placed in water. Ohl and Brattain eventually developed a new branch of quantum mechanics, which became known as surface physics, to account for the behaviour. The electrons in any one piece of the crystal would migrate about due to nearby charges. Electrons in the emitters, or the "holes" in the collectors, would cluster at the surface of the crystal where they could find their opposite charge "floating around" in the air (or water). Yet they could be pushed away from the surface with the application of a small amount of charge from any other location on the crystal. Instead of needing a large supply of injected electrons, a very small number in the right place on the crystal would accomplish the same thing. Their understanding solved the problem of needing a very small control area to some degree. Instead of needing two separate semiconductors connected by a common, but tiny, region, a single larger surface would serve. The electron-emitting and collecting leads would both be placed very close together on the top, with the control lead placed on the base of the crystal. When current flowed through this "base" lead, the electrons or holes would be pushed out, across the block of semiconductor, and collect on the far surface. As long as the emitter and collector were very close together, this should allow enough electrons or holes between them to allow conduction to start. The Bell team made many attempts to build such a system with various tools, but generally failed. Setups where the contacts were close enough were invariably as fragile as the original cat's whisker detectors had been, and would work briefly, if at all. Eventually they had a practical breakthrough. A piece of gold foil was glued to the edge of a plastic wedge, and then the foil was sliced with a razor at the tip of the triangle. The result was two very closely spaced contacts of gold. When the wedge was pushed down onto the surface of a crystal and voltage applied to the other side (on the base of the crystal), current started to flow from one contact to the other as the base voltage pushed the electrons away from the base towards the other side near the contacts. The point-contact transistor had been invented. 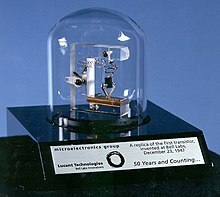 While the device was constructed a week earlier, Brattain's notes describe the first demonstration to higher-ups at Bell Labs on the afternoon of 23 December 1947, often given as the birthdate of the transistor. What is now known as the "p–n–p point-contact germanium transistor" operated as a speech amplifier with a power gain of 18 in that trial. John Bardeen, Walter Houser Brattain, and William Bradford Shockley were awarded the 1956 Nobel Prize in physics for their work. Shockley was incensed, and decided to demonstrate who was the real brains of the operation. A few months later he invented an entirely new, considerably more robust, type of transistor with a layer or 'sandwich' structure. This structure went on to be used for the vast majority of all transistors into the 1960s, and evolved into the bipolar junction transistor. With the fragility problems solved, a remaining problem was purity. Making germanium of the required purity was proving to be a serious problem, and limited the yield of transistors that actually worked from a given batch of material. Germanium's sensitivity to temperature also limited its usefulness. Scientists theorized that silicon would be easier to fabricate, but few investigated this possibility. Gordon K. Teal was the first to develop a working silicon transistor, and his company, the nascent Texas Instruments, profited from its technological edge. From the late 1960s most transistors were silicon-based. Within a few years transistor-based products, most notably easily portable radios, were appearing on the market. The static induction transistor, the first high frequency transistor, was invented by Japanese engineers Jun-ichi Nishizawa and Y. Watanabe in 1950. It was the fastest transistor through to the 1980s. A major improvement in manufacturing yield came when a chemist advised the companies fabricating semiconductors to use distilled rather than tap water: calcium ions present in tap water were the cause of the poor yields. "Zone melting", a technique using a band of molten material moving through the crystal, further increased crystal purity. ^ "Semiconductor Shipments Forecast to Exceed 1 Trillion Devices in 2018". www.icinsights.com. Retrieved 2018-04-16. Annual semiconductor unit shipments (integrated circuits and opto-sensor-discretes, or O-S-D, devices) are expected to grow 9% [..] For 2018, semiconductor unit shipments are forecast to climb to 1,075.1 billion, which equates to 9% growth for the year. Starting in 1978 with 32.6 billion units and going through 2018, the compound annual growth rate for semiconductor units is forecast to be 9.1%, a solid growth figure over the 40 year span. [..] In 2018, O-S-D devices are forecast to account for 70% of total semiconductor units compared to 30% for ICs. ^ Ernest Braun & Stuart MacDonald (1982). Revolution in Miniature: The History and Impact of Semiconductor Electronics. Cambridge University Press. pp. 11–13. ISBN 978-0-521-28903-0. ^ Patrick Mccluskey, F.; Podlesak, Thomas; Grzybowski, Richard (1996-12-13). High Temperature Electronics. ISBN 978-0-8493-9623-6. ^ Information, Reed Business (1986-01-02). "New Scientist". ^ "How Yamaha Got into the Semiconductor Business". 2017-02-24. Muller, Richard S. & Theodore I. Kamins (1986). Device Electronics for Integrated Circuits. John Wiley and Sons. ISBN 978-0-471-88758-4.